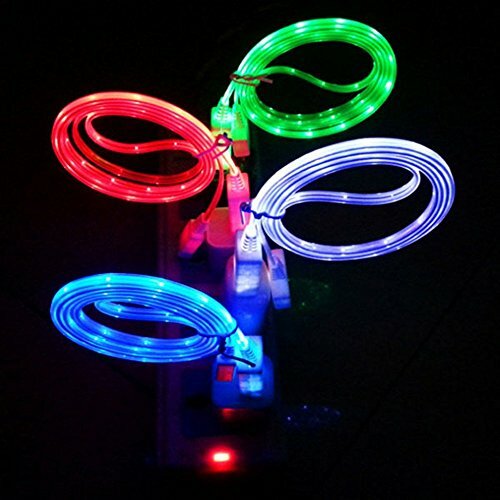 - With LED lights in full cables, when charging or sync data, you will see Led Light Lights up, very beautiful and cool. - The cable will light up if being connected, but the brightness of the led light depends on the distance from the USB connector to the led, much further, much weaker. And the led light will be much effective in darker place. Compatible with: Samsung Galaxy S4, S3, S2, Note 2/4; HTC One, EVO, Thunderbolt, Incredible, Droid DNA; Motorola ATRIX, Droid; Google Nexus 4, Nexus 7, Nexus 10; LG Optimus G1 G2 G3, customized for Android Devices, and all devices with Micro USB Ports.